The next recession is out there somewhere. Meanwhile, we’ve got other problems. So Ylan Mui warns that a recession is out there somewhere, and we’re getting closer to it every day. Really, all Mui et al have to say here is that a) the current expansion is long-in-the-tooth relative to its predecessors, and b) headwinds exist. The latter include slower growth in China, a possible deceleration in payrolls (about which more below), DC dysfunction in the face of some portentous events (e.g., the debt ceiling), the strong dollar bumping up the trade deficit, and volatile financial markets. One fairly strong point pushing the other way is that the Federal Reserve, with its hundreds of staff economists serving some of most elite economists in the world, is getting ready to raise rates to head off nascent inflation. I don’t see it and am more worried about dis-inflation than spiraling price growth, but hard to square where the Fed’s at these days with pending recession (that said, there’s dispute within its portals). Bottom line: I wouldn’t take any of these predictions too seriously. That’s not to say they’re wrong; it’s just that economists don’t have much of a track record calling turning points. Thus, the weight you give to those warning of a recession should be much like the weight you’d give to the observation that someone who is getting old is closer to death than someone who is young. It’s generally true but it’s also axiomatic. We do not face serious resource constraints. There are about two percentage points of slack in the job market (i.e., depressed labor force participation and elevated underemployment amount to about two percent of the labor force), capacity utilization remains below its prior peak (and has fallen in recent months), and as noted, wage and price inflation are too low, not too high. I very much agree that the possibility of a policy mistake must be taken seriously. The debt ceiling is the biggest potential threat, and while I expect grownups will prevail, it’s a non-trivial economic mistake to even squabble about it (11 hours on Benghazi hearing, check! Raise the debt limit, uncheck…). A premature interest rate hike would also be a policy mistake, though 25 basis points will not tilt the recessionary balance. Meanwhile, the combination of solid job growth and low inflation (such that stagnant nominal earnings growth translates into real earnings growth) has kept consumption—68 percent of GDP—percolating along at a decent clip, adding an average of two percentage points to annual GDP growth since 2014. What worries me right now is less a recession-inducing demand shock, like the huge reversal in the wealth effect and leveraging cycle that crushed demand in the Great Recession, and more a) the slow bleed of supply-side weaknesses that may be more structural than cyclical, specifically labor force participation and productivity growth, and b) if there were a recession, the collision of the zero-lower bound at the Fed with a dysfunctional, austere Congress. The overall labor force participation rate is down about 3.5 percentage points since the recession, but part of that decline, about 2 points by my estimation, is due to aging boomers leaving the job market. 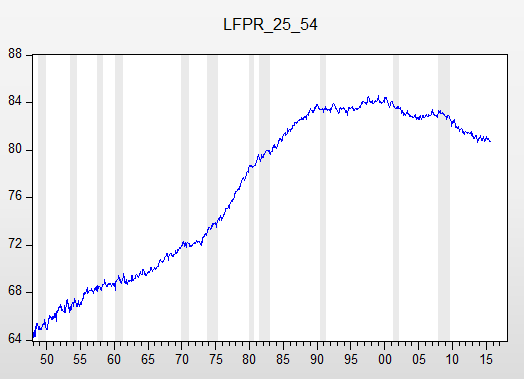 Still, the prime-age (25-54) trend, excluding retirees, basically peaked 25 years ago, around 1990, and has been falling or flat since (see graph below). The causes of the decline in labor supply of prime-age workers are not well understood but it must be at least partially driven by persistently weak demand for certain workers in this age range, like displaced production workers. BTW, a smaller share of the working-age population in the job market means that it will take fewer jobs per month to lower the unemployment rate. Monthly job gains well below 200,000, for example, will translate into lower unemployment if the LFPR stays this low. I’m not saying that’s a good thing, but unless the LFPR starts to climb again, don’t be surprised if we don’t hit 200K on monthly payroll gains yet the jobless rate still falls. 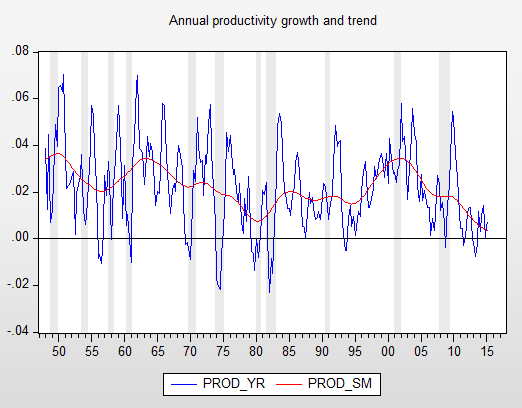 The productivity slowdown is even more worrisome. As the trend drawn through the annual percent changes shows (see chart below), productivity growth is as slow as it has ever been. Some argue that there are measurement issues in play. Specifically, quality-adjusted computer prices which used to fall steeply every year (thus boosting real output) have recently been flat. But even if this were so, and I’ve heard arguments on both sides, it would explain a pretty small share of the deceleration. Much like our difficulty catching turning points, economists are hard pressed to explain productivity trends (you may at this point be wondering why people pay economists so much money—good question, but keep it to yourself, please). Weak investment is an obvious culprit, but why has investment been so weak? Surely investment capital is abundant and cheap. You’re going to (quite reasonably) remind me that if my only tool is a hammer, everything looks like a nail, but I think the absence of full employment is in the mix. Stronger labor demand would boost the quantity and quality of jobs, pulling more potential workers back into the job market. It would also, as per the Keynesian investment accelerator, boost investment. And in full employment conditions with labor costs rising, employers have to find new efficiencies to maintain profit margins. That’s certainly part of the story of the latter 1990s, along with the wrinkle that Fed chair Alan Greenspan recognized that with faster productivity growth, unemployment could fall far below what they thought to be the “natural rate” at the time without triggering price pressures (technically, unit labor costs were stable, as both compensation and productivity accelerated). That’s right, folks: I think there’s a full employment productivity multiplier. I’ve yet to figure out how to prove it, though it’s true that slack “Granger causes” trend productivity growth but the reverse is not true (where slack is unemployment minus CBO’s NAIRU; I used six lags). One last point. From here on, I declare that any discussion of a recession must reference the results from this new paper on the impact of the countercyclical measures undertaken in the last downturn. It’s by noted economists Alan Blinder and Mark Zandi and was written as part of our full employment project. Not only does it solidly confirm that much of what we did back then worked pretty well; it also provides important lessons for next time around. So, like the rabbi in Fiddler on the Roof said when asked for a blessing for the Tsar—“God bless and keep the Tsar…far away from us!”—let’s hope the next recession is “far away from us” and let’s certainly not do anything to bring it any closer, like futzing around with the debt ceiling. And if we’re smart, as per Blinder/Zandi, we’ll keep our policy power dry and ready for action when the time comes. Share the post "The next recession is out there somewhere. Meanwhile, we’ve got other problems." 4 comments in reply to "The next recession is out there somewhere. Meanwhile, we’ve got other problems." Surely you jest when you think that austerians and others of that ilk will take the thoughts and recommendations of Blinder and Zandi to heart when it comes to evaluating the post 2009 crash policies. These folks are going to base their policy making and decision making on facts?!? You must be kidding, right?!? But see the part where I declared it so! They resist my logic at their peril! How do we get back to full employment? Increasing our budget deficits. Why are governments in the industrial world pursuing austerity instead? Most observers agree that a major motivator has been public/politicians’ fear of growing debt to GDP ratios. We know these fears are greatly overblown, but there is some legitimacy to worries that, some day, higher interest payments on national debts will politically crowd out social spending. Yet we can stimulate our economies without incurring more public debt: the central banks could finance the necessary budget deficits with direct transfers into their governments’ spending accounts. At the same time, if you like, the central banks could sell an equivalent amount of government bonds in their portfolios, taking the same amount of cash out of the base money supply. Why don’t we start a conversation about financing stimulus by creating money and just spending it? This is politically unthinkable now. Perhaps it would become thinkable if progressive economists started talking about it. Whatcha think? If there is an economic downside to this, I’d be delighted to hear it. Thanks. 3 million young people graduate from high school every year (more, including college grads) and 1 million retire on Social Security every year. So the ratio wouldn’t be 3.5-2 but more like 3-1.